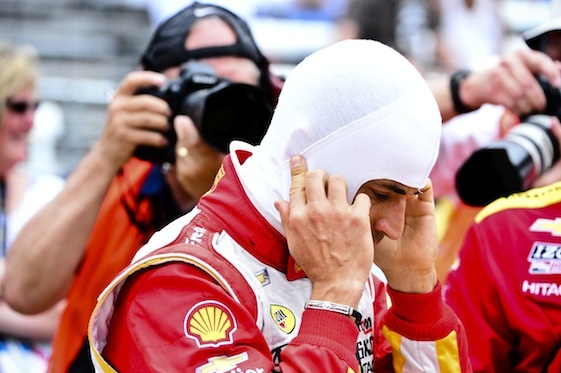 INDIANAPOLIS – There was a time when Helio Castroneves thought the Indianapolis Motor Speedway was an easy place to figure out. The colorful Brazilian driver came to Indy for the first time in 2001 and surprised everyone, including himself, by winning the race. A year later, he returned to Victory Lane, the first driver ever to win in his first two tries at the speedway and the first driver to repeat since Al Unser in 1970-71. In 2003, Castroneves was extremely disappointed to finish second to Penske Racing teammate Gil de Ferran. This place was easy, right? “I never thought it was easy, but having all that early success did make me think I had a chance to win every year,’’ Castroneves said. That’s when the historic track on the Westside of Indianapolis began to show its teeth to Castroneves. After consecutive ninth place finishes, a crash in 2006 relegated him to 25th, by far his worst finish here. He did. In 2009, Castroneves was dominant, winning from the pole. Since the third win, Castroneves has finished ninth, 17th and 10th. It’s the worst stretch he’s had in 12 years coming to the speedway. “When I walk into this place, I get the chills,’’ Castroneves said. “We went to the (speedway) museum the first night (in town) to see all the history of this place. It’s incredible. It’s never the same. Always, there is something different. Castroneves, who will start eighth in the 33-car field, is among the favorites again this year, with a chance to give team owner Roger Penske his 16th Indy victory. “Obviously, in the situation we are in right now, we’re certainly feeling very confident. We know what we need to do,’’ Castroneves said. And, don’t forget, Castroneves has a secret weapon when he comes to Indy: Rick Mears. Team Penske advisor and driver coach Mears is a four-time Indy 500 winner, along with only A.J. Foyt and Unser. But Castroneves says Mears has done a lot more than that for him. If he does get that fourth win on Sunday, Castroneves will appreciate it even more than his wins here in the past.